You need to get an urgent document signed by a client. You’re out and about. You only have your phone with you. To make matters worse, the weather is bad, the traffic is mad and you don’t have time to get back to the office or to a copy shop before. What do you do? Easy! Use SignEasy – and create an electronic signature on your android device. Okay, in case you missed the memo, electronic signatures are simply signatures that you sign on your digital device – this could be your desktop, your smartphone or your tablet. Electronic signatures can be verified and tracked in such a way that they are as legally binding as handwritten signatures. How much does an electronic signature solution cost? Isn’t that expensive? Signeasy’s e-sign android app is the greatest value for money electronic signature solution on the market for SMBs and, according to our clients, is the most user-friendly app on the market as it offers great functionality. Unlike many companies who charge on a per document usage, SignEasy is based on a subscription based on the number of users you need for your business. Our plans truly offer unlimited documents, as we understand that some of our users need to send hundreds of documents every month. Electronic signatures are far more value for money than the costs of physical hard copies that require buying paper, printing, scanning, transporting and storing all your most important paperwork. Electronic signatures are generally much quicker to receive signatures and send out than online fax systems. What’s the limit on number of signatures for each document? There is no limit on the number of signatures each signee can make on a SignEasy document. How secure are electronic signatures on Android devices? There’s a lot of security built into the SignEasy app as all the data is encrypted when it is stored and one the move. For any critical data, we recommend you set a 4-digit passcode for when you log-in. Okay, so how easy is it to sign on my phone? It’s easy to e-sign on your Android device. You can import (upload) an existing electronic signature of your own and use that. You can import from email, from a cloud system, from an SD card, or even forward it from an email. Alternatively, you can self-sign or ask someone else to sign by drawing a signature directly onto the document from our ink-like signing system. It’s easy to sign in-person too! Can I ask someone to sign a document who isn’t standing next to me? From your Android device, you can request a signature from another individual by requesting a signature via email. Can I self-sign on my Android device? You can self-sign on your Android device easily, even if there are multiple signees on the same document! Just add your email address to the list of signers and you will be included in the signature flow. How do I know when my document has been signed by other parties? You will receive a notification by email when your document has been signed by other parties. Also, in your SignEasy dashboard, you will see under documents those that are still pending and those that have been completed. If you want to send automatic reminders, you can check a box prior to sending your request. Learn more about how to create an electronic signature on an Android device here. 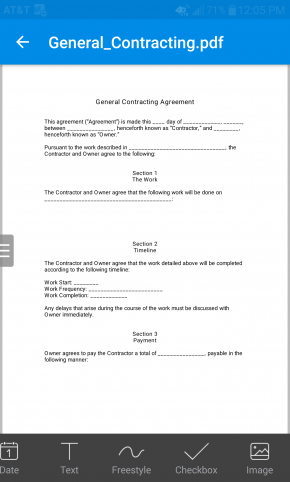 Does SignEasy let me make other amends to a document on my Android device? In addition to signing and dating documents, SignEasy lets you add text, images and checkboxes or radio buttons – how good is that? 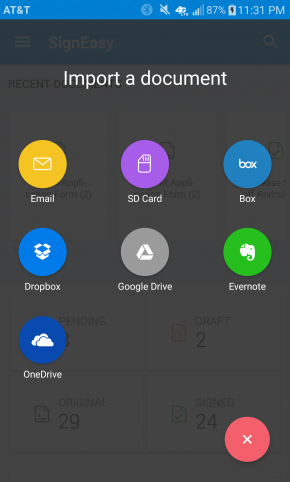 How much phone storage will the SignEasy app take on my Android device? When you download the SignEasy app, it takes just 70mb. Does my SignEasy Android mobile app sync with other devices? Every single device you use SignEasy on will synch with other devices. So, for example, if you sign on your Android phone, when you next log in from a different platform, such as a tablet or desktop, you will see the latest version. Can I store my signed documents in a cloud? 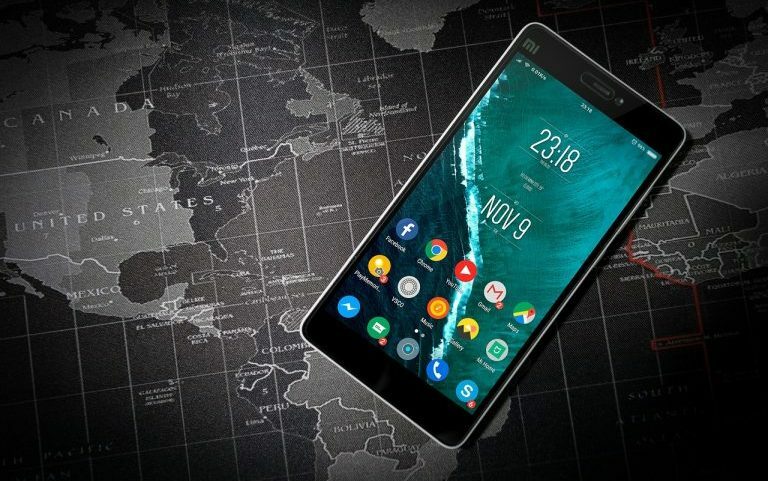 Once you have created your electronic signature on your Android device, it’s easy to keep your phone data storage down as SignEasy integrates with several cloud storage options so that you can import documents from the cloud. You can also store signed documents back to the cloud. SignEasy supports all the most popular cloud storage solutions. How do I share signed documents via my Android device? It’s easy to search, rename and delete documents when you create an electronic signature on your Android device on the SignEasy app! You can share with all of our third party integrated cloud systems or via email. Find our more with our quick video. Sign up for an obligation-free 15 day trial when you download the SignEasy Android app today!